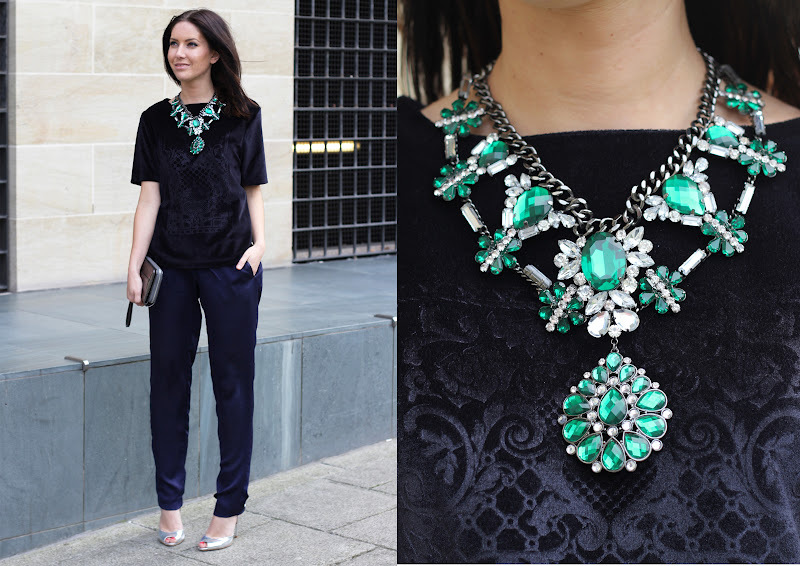 Todays outfit - a whole lot of navy and Elizabeth Taylor style jewels. The weather has started to turn slightly in Newcastle, autumn is unfortunatley just around the corner. With that in mind i have started to make the transition, this year isnt proving so hard as it seems summer never even really began. Although i am not ready for the cold weather, i am ready to embrace the new season and all the beautiful fashion its set to bring. My highlights are luxurious fabrics, brocade, flock and velvet. Flat shoes making a welcomed return, leather everything, the pairing of navy and black and colbalt blue. You look gorgeous! This necklace is spectacular! Love the metallic Zara shoes, I'm soon to return to Newcastle are they available in the Metro Centre?